Most of us will live our whole lives without ever traveling to the countries Jessica Alexander takes us in her book “Chasing Chaos: My Decade In and Out of Humanitarian Aid.” Sans passports, we readers willingly follow Jessica to places diverse and, to the outsider, often frightening: Rwanda, Indonesia, Sierra Leone, Haiti and more. 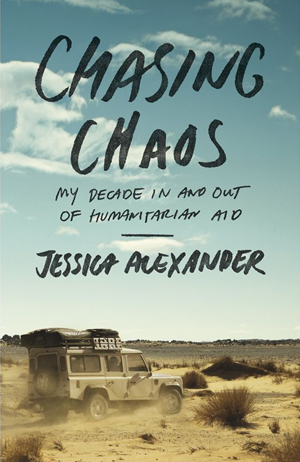 Much is written about humanitarian aid from a clinical perspective, but Alexander’s firsthand account of delivering international aid is dramatic and gripping. Her memoir crosses war, political challenge, genocide and natural disaster, spanning multiple countries and years. Alexander also provides context to her account in order to help the reader better understand international aid. She succulently explains the complexity of the aid community without being dry or overtly academic. As Alexander moves from a fresh-faced recent graduate to a respected member of the aid community, we see her manage deep challenges in balancing organizations’ overall mission with her specific roles and personal feelings about the aid industry. Most fascinating is how daily life and national crises can blend together when doing overseas humanitarian work. Alexander’s account of trying to go on a date with Pete, a “hot Australian” from the United Nations, before being moved to a different part of North Darfur was a great slice of life showing the challenges of having a personal life when your job is as heavy — and as meaningful — as saving the world. The aid community has many more nuances than an outsider would originally consider. Reading this book is a chance to step inside a world that would otherwise stay hidden, outside the bounds of the eyesight of the average American.